Natural Dog Food Formula with Four High Quality Meat Meals and Reduced Fat and Protein Dogs Love the Taste! 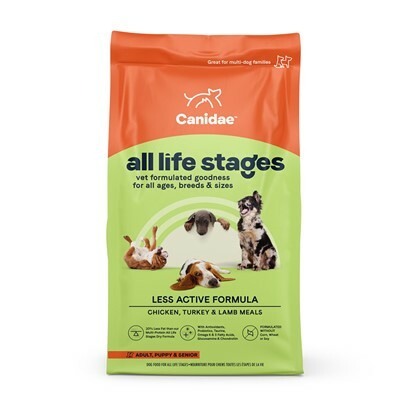 CANIDAE PLATINUM Senior and Over Weight formula is formulated to meet the nutritional levels established by the AAFCO Dog Food Nutrient Profiles for maintenance. Superior Palatability, Digestibility and Nutritional Benefits! Chicken meal, brown rice, white rice, rice bran, peas, potatoes, oatmeal, cracked pearled barley, millet, turkey meal, lamb meal, chicken fat (preserved with mixed tocopherols), tomato pomace, natural flavor, flaxseed meal, ocean fish meal, choline chloride, glucosamine hydrochloride, chondroitin sulfate, psyllium seed husks, suncured alfalfa meal, inulin (from chicory root), lecithin, sage extract, cranberries, beta-carotene, rosemary extract, sunflower oil, yucca schidigera extract, dried enterococcus faecium fermentation product, dried lactobacillus acidophilus fermentation product, dried lactobacillus casei fermentation product, dried lactobacillus plantarum fermentation product, dried trichoderma longibrachiatum fermentation extract, vitamins (vitamin E supplement, thiamine mononitrate, ascorbic acid, vitamin A supplement, biotin, niacin, calcium pantothenate, pyridoxine hydrochloride (vitamin B6), vitamin B12 supplement, riboflavin, vitamin D3 supplement, folic acid, minerals (iron proteinate, zinc proteinate, copper proteinate, ferrous sulfate, zinc sulfate, copper sulfate, potassium iodide, manganese proteinate, manganous oxide, manganese sulfate, sodium selenite), papaya, pineapple. *For best results, divide the daily recommended amount into 2 feedings daily. Always have plenty of fresh water available and visit your veterinarian for regular check ups.